A water heater is designed to bring hot water to a home for at least 10 years. But even with periodic maintenance and use, these steadfast appliances sometimes need repairs. If your water heater needs repair, Sunshine Plumbing and Gas has the experience and skills to quickly bring back the hot water. We rely on our water heaters to bring hot water to our homes and businesses day and night. So when a leak occurs, contact our plumbing repair company. Our plumbers are punctual and highly skilled which means you receive quality repairs every single time. Which Factors Are Important In Choosing A Water Heater? Having a water heater properly sized to your home and the demands of those living it in not only keeps up with those demands but saves money through efficiency. Sunshine Plumbing and Gas will help you determine what type of water heater is appropriate for your homes, such as a tankless water heater or a storage water heater with a tank and heat pump. Questions we’ll ask to help determine the type and size, including the following. Once the type is decided on, the next step is sizing. How many people are showering and when? Does the home have a tub or whirlpool? What major appliances need hot water? A tankless water heater is sized by the hot water flow rate. Without a tank, this style uses and heats water on demand. Not only are these water heaters more efficient than traditional water heaters, they also provide hot water at a quicker rate than other models. A storage water heater stores a predetermined amount of water in a tank and only adds water to the tank when water is used. Tanks range in size from 30- to 80-gallons, depending on the number of people living in the home and expected demand amounts. What Are The Signs Of A Water Heater Leak? Not all signs of leaks for hot water systems are as apparent as a neon sign. It can be easy to overlook a plumbing leak during daily life, but if you notice any of these signs, it’s important to call Sunshine Plumbing and Gas as soon as possible for repairs. It may sound obvious but dripping water sometimes can be mistaken for condensate on the unit. 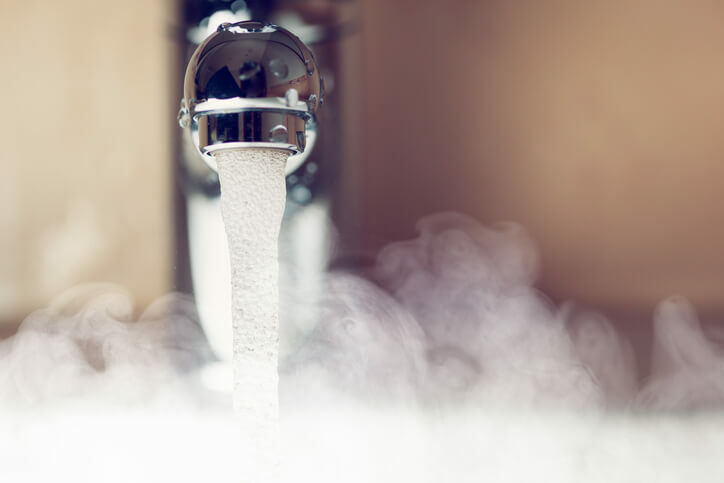 Usually, water will drip from the temperature and pressure valve as it vents excess steam, but a large volume of water is cause for a call to the plumber. Corrosion around the pipes, pipe fittings or any part of the hot water tank is a sign a leak either has or is occurring. Even a slow leak through corrosion means the unit will likely need replacement sometime soon. What Should I Do If A Leak Happens? If a leaking water heater is responsible for a lukewarm or even cold shower, here are a few steps to take before the plumbers arrive. Following the manufacturer’s instructions, either turn the gas control knob to the pilot position or turn off the circuit breaker controlling the water heater and disconnect the power supply. A water heater has a shut-off valve located outside the house, usually near the cold water pipe entrance. Other times this shut-off valve is located near the water heater itself, marked with a red handle. What Should I Do If The Water Heater Bursts? Water heaters can burst for several reasons, including a malfunctioning thermostat or corroded pipe fitting. And though a burst is not common, when it does happen, gallons of water quickly rush into your home and cause even more issues than just a plumbing repair. Mitigate the damage by following these four steps. The heating element on a water heater can retain its heat for some time after a water heater bursts. Not only does it present a fire hazard to the home, but it can also cause burns if touched during repairs. Follow the steps for disconnecting the power as listed in the manufacturer’s instructions. Even after the hot water tank has burst, water will continue to fill the tank from the cold water supply pipe unless it’s turned off. Turn off the supply pipe by turning the valve clockwise until it stops turning. Otherwise, the supply pipe will continue to bring in more water due to the burst. Our team will assess a burst water heater as soon as they arrive and begin resolving the issue. With quality plumbing services and up-to-date information, you can be assured our plumbers will give you the best solution for a burst water heater. Your homeowners' insurance will want to figure out why the burst happened in the first place and depending on the policy, reimbursement for the water damage may be applicable. Do You Provide Water Heater Installations? Sunshine Plumbing & Gas installs tankless and storage water heaters in homes throughout the Ocala, FL area. The installation process is generally completed within three hours and includes removing the old water heater. As with any installation, we only install what will fit your home and lifestyle needs.